Sir Salman Rushdie's archive, housed at Emory's Manuscript, Archives, and Rare Book Library, is open to the public. The celebrated writer's computer files, private journals, notebooks, photographs and manuscripts provide insight into his creative process, campaigns for human rights and celebrity. Rushdie's latest book, "Joseph Anton: A Memoir," chronicles his life during the fatwa. As a University Distinguished Professor at Emory, Rushdie teaches, presents public lectures and engages with the academic community on campus. He initially served as a Distinguished Writer-in-Residence. 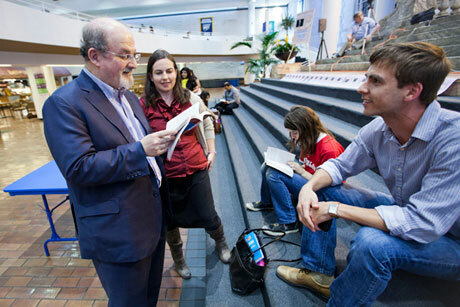 Emory alum Michelle Miles (standing) and Levin Arnsperger (right), a doctoral student in English, visit with University Distinguished Professor Salman Rushdie during a marathon reading of "Haroun and the Sea of Stories" in the Dobbs University Center. Emory Photo/Video. Acclaimed author Salman Rushdie returned to Emory University in February as University Distinguished Professor for a public lecture on human rights.